Physicists in the College of Arts and Sciences have made science history by confirming the existence of a rare four-quark particle and discovering evidence of three other “exotic” siblings. Their findings are based on data from the Large Hadron Collider (LHC), the world’s biggest, most powerful particle accelerator, located at the CERN science laboratory in Geneva, Switzerland. Professor Tomasz Skwarnicki and Ph.D. student Thomas Britton G’16, both members of the Experimental High-Energy Physics Group at Syracuse and the Large Hadron Collider beauty (LHCb) collaboration at CERN, have confirmed the existence of a tetraquark candidate known as X(4140). They also have detected three other exotic particles with higher masses, called X(4274), X(4500) and X(4700). 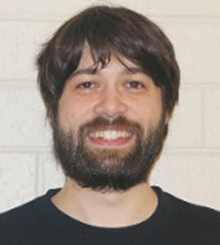 All four particles were the subject of Britton’s Ph.D. dissertation, which he defended in May and then submitted, on behalf of the LHCb collaboration, as a journal article to Physical Review Letters (American Physical Society, 2016). “Even though all four particles contain the same quark composition, each of them has a unique internal structure, mass and set of quantum numbers,” says Skwarnicki, who, in April 2014, confirmed the existence of the world’s first charged tetraquark candidate, called Z(4430)+. A year earlier, he and Ph.D. student Bin Gui G’14 determined the quantum numbers of the first neutral, heavy tetraquark candidate, X(3872). Quantum numbers describe each particle’s subatomic properties. Skwarnicki says the measurement of all four particles is the largest single one of its kind to date. Unlike other exotic particle candidates, his and Britton’s do not contain ordinary nuclear matter (i.e., quarks found in protons and neutrons). “We’ve never seen this kind of thing before. 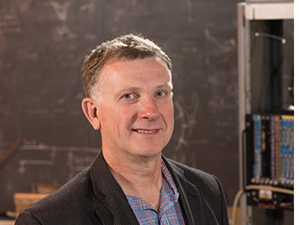 It’s helping us distinguish among various theoretical models of particles,” Skwarnicki says. Skwarnicki’s work focuses on quarks—fundamental constituents of matter that serve as a kind of scaffolding for protons and neutrons. 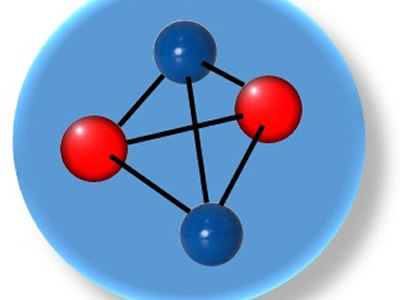 While most particles have two or three quarks, Skwarnicki and others, in the past decade, have observed ones with four or five. Last summer, he and doctoral student Nathan Jurik G’16 teamed up with Distinguished Professor Sheldon Stone and Liming Zhang, a professor at Tsinghua University in Beijing, to announce their discovery of two rare pentaquark states. The news made headlines, thrusting Syracuse and CERN into the international spotlight. That all four quarks in the new family are “heavy” is noteworthy. Extremely rare and four times heavier than a proton, X(4140) has been initially detected only 20 times out of billions of man-made energy collisions. LHCb is uniquely suited to study such particles, and thus, has gone on to detect X(4140) nearly 560 times. Skwarnicki attributes the discovery of X(4140)’s three siblings, culled from LHCb data from 2011 to 2012, to increased instrumental sensitivity. It is the energy configuration of the quarks, he explains, that gives each particle its unique mass and identity. Syracuse’s research for the LHCb collaboration is supported by the National Science Foundation.